How many of you have friends or family that are suffering in their family story and you want to help them? We’ve designed this Family Healing Program for Small Groups to help you reach those people that you love. This program revolutionized my family and it can revolutionize yours. Found in Small Groups, Study Guides, Video & Audio. This Package not only provides the materials you need to outreach to friends (just show the DVD and talk through the questions we provide in the workbook!) but it also provides all the additional materials you need to host your own Small Group, including invitations, tips for a successful small group and additional questions to help you walk your friends through this message. Your families will never be the same!! Families are hurting today – not because of a lack of wanting to have a great family, but because many find themselves in broken families that they don’t know how to fix. If that sounds familiar - this series has been written to bring healing to bring healing to your family story. The Blessing of the Father for Families is an educational program where Pastor Ed coaches you through everything you’ve always wanted to know about how to heal your family story. It includes a 6 session(week) video series with a corresponding workbook, including Questions for Reflection and Time with My Father Devotional. Watch each session at your own pace from the comfort of your home while going through the Workbook. Are you ready to receive the healing your family needs?! Beloved, that search for a father, which Thomas Wolfe so beautifully described, is the reason we wrote and filmed The Blessing of the Father for Families. “Orphans we are, not a father in sight, and our mothers no better than widows” (Lamentations 5:3, MSG). This is the type of wounding that happens when someone tries to face life without a present, loving father who knows how to bless him/ her with his words and actions. The effect of not having such a father is devastating. I wrote my first book, The Difference a Father Makes, to share my story with a larger audience, and I was blown away by the response it received. Those who read it bought it for their friends and gave it away as gifts on Father’s Day. Moms read it and responded as well. It was incredible to see healing come to families with every kind of background from the shared connection of our father wound. Beloved, that’s why we created this new series: The Blessing of the Father for Families. It’s for you and by you. How, you might ask? We have taken the questions you most often asked, combined them with what I’ve learned over the last 12 years since I wrote The Difference a Father Makes, and then created something that I truly believe will help you in your story right now. Whether or not you’ve read The Difference a Father Makes, whether or not you’ve been to one of our conferences, within this series you’ll find the tools and keys you need to receive and give away the Blessing of the Father for your family. I meet people every day still searching for the Father they’ve always wanted. They want to bless their family and their kids, but without a blessing from their own father, they have no idea where to start. They find themselves stuck, in their relationships, in their own backstory, in their choices, and they don’t know why. They feel alone in their story because they never had a father who was present and knew how to bless them. We designed this product with your family story in mind so that no matter what kind of family story you have, you can encounter the only Father who can heal and make you into the person Jesus has called you to be. It doesn’t matter how your story started, Beloved. God has a plan to heal your story and restore your family. I’m so glad you’re here. Did you know we were made to be fathered by God, that His love and blessing can heal you and your family stories? When we allow God to father us, it changes the way we live and connect with our families. Many of us have not had a father who knew how to be physically or emotionally present in our life. This leaves a father “wound” affecting every aspect of our lives, and can hinder us from being all we can be in our personal relationships. 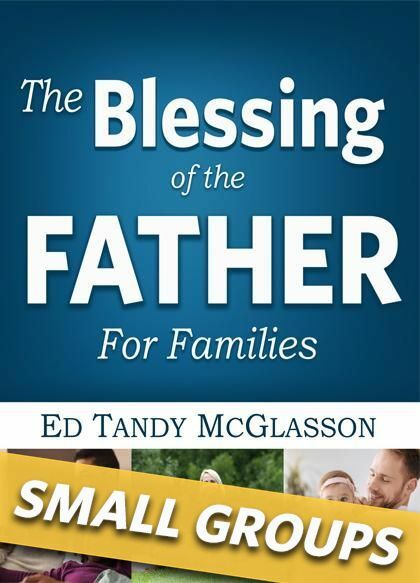 Ed Tandy McGlasson has helped thousands of families receive the love and blessing of the Father through His son Jesus. His latest work, The Blessing of the Father for FamiliesWorkbook with DVD, shares the life changing power the Father’s blessing can have in your life and family. Ed and his wife Jill have been married and in ministry for 35 years and have five beloved children, three of which are newly married and their first granddaughter ‘Isla Jeanne’. The Father loves you and sent His Son to let you know!